I’ve been taking another round of photography classes this term, which has been pretty good for the learning. Since both classes are mostly lecture style and photography takes place on our own time (a fact which is rapidly becoming clear to me, since I still have quite a few assignment photos to take in the next month), it means I’ve gotten in a bit of knitting time during class. By now everyone knows that I’m The Knitter, and one woman who sits behind me was chatting with me one evening before class started. 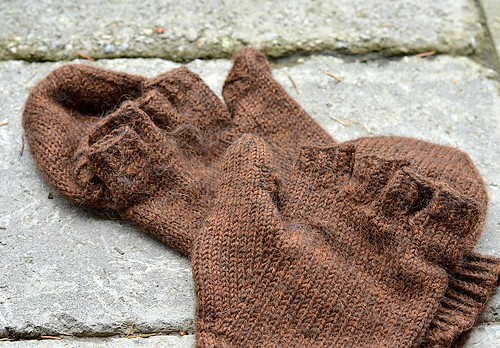 It turns out she also knits a bit, and she asked me more about the knitting – specifically, “how do I stop things from pilling?” And then she pulled out a pair of soft alpaca fingerless mitts that had pilled all to heck. Many of you are probably nodding your heads and already know exactly why those mitts were pilled up, but if you’re curious to know more about this, I thought I’d do a bit of a post about it. 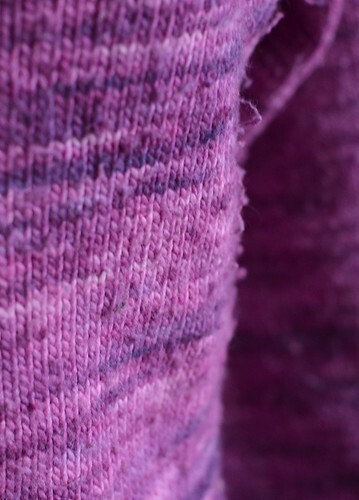 Pilling is an unfortunate side effect of most knitted or woven garments. 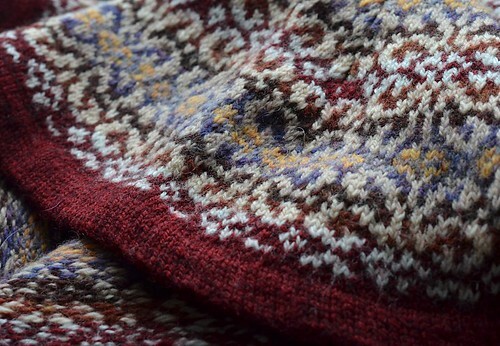 If you go to your closet (or take a close look at your rugs) and look at any of your commercial or handknit sweaters, you’ll probably notice some amount of pilling on most of them. Probably you’ll notice some similarities amongst the locations of the pilling, or the kind of garments/fibers/yarns that seem to attract it the most. Pilling is what happens when the fibers in your yarn encounter friction, when in the knitted state, and then start to come apart into little bits of fuzz. The amount or rate of pilling depends on what you have done to encourage or discourage this from happening. For knitted garments this is most likely a factor of: the amount of friction, the type or ply of yarn, and the kind of garment or how it is worn/used. We encounter a lot of friction with knitted garments because they are worn on our bodies, which move a lot, and also because knitted fabric is designed to stretch and move with us – more so than woven fabric, for example. Most garments will generate pilling very quickly in specific areas simply due to how they are worn. Take socks, for example. In the above photograph I’ve got two different socks knitted in the same yarn (Madelinetosh Tosh Sock, a plied superwash merino wool yarn). 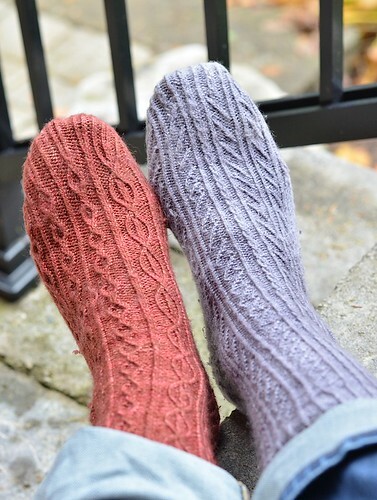 My Phellogen socks (in sequoia orange) are on the left, and my Revival socks (in composition book grey) are on the right. 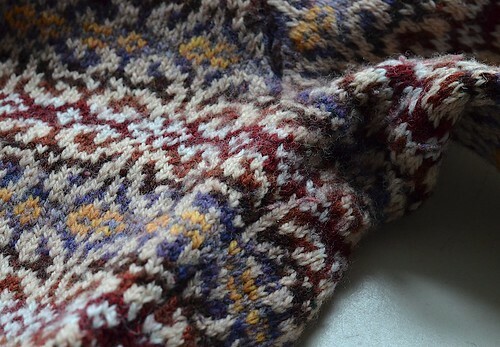 I knitted the Phellogens just over 1 year ago, and the Revivals about two and a half years ago. Just looking at the top of the feet there isn’t actually much noticeable damage other than a bit of colour-fading, and that’s as it should be – most of my shoes are slip-ons that leave the top of the foot visible, so there isn’t a lot of abrasion to be expected across the arches. On the other hand, if I were wearing these a lot with Mary Jane style shoes with a strap across the top of the foot, I would be likely to see some fuzz there in a nice neat line. The heels, of course, are a different story. The grey Revivals have 2.5 years of wear to show for them, and it’s visible along the heel flap. Every time you slip your foot in and out of a shoe, the heel rubs against the back of the shoe and generates friction – ta-da! Pilling like nobody’s business. The orange Phellogens on the other hand have only 1 year of wear (and are competing with more socks in the sock drawer for wearing time to boot, being 1.5 years behind the Revivals), and so have had less opportunity to generate pilling. The best recourse against this – or rather, to delay it further, since it’ll happen no matter what – is to knit socks more tightly, to prevent friction between stitches, to knit socks with nylon spun into the yarn (not so coincidentally, many “sock yarns” are so named because they have a small amount of nylon content in them), or to use reinforcement thread at the heels and toes where abrasion is most prominent. Or, knit dozens and dozens of pairs of socks so each pair won’t wear down as quickly. 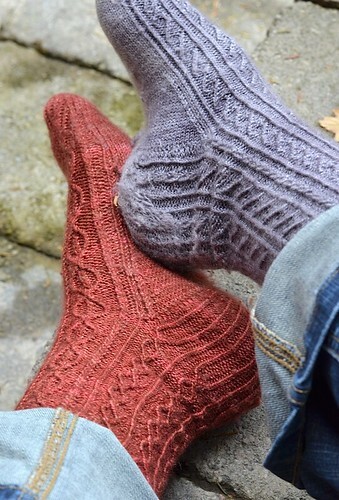 (Personally this is my preferred option, and why I always have a pair of socks for myself on the needles). Sometimes pilling isn’t a matter of wear so much as the yarn itself. Generally, the softer the yarn feels, the more likely it is to pill. Soft yarn which has been plied very loosely or not plied at all (“single spun” yarns) is a big culprit here. It’s a big tradeoff because yarns that are soft are sooooo comfortable to wear, which is why we keep buying them. Either you can have yarn that doesn’t pill as fast, or you can have yarn that feels like purring kittens – but I have yet to encounter a yarn that does both. 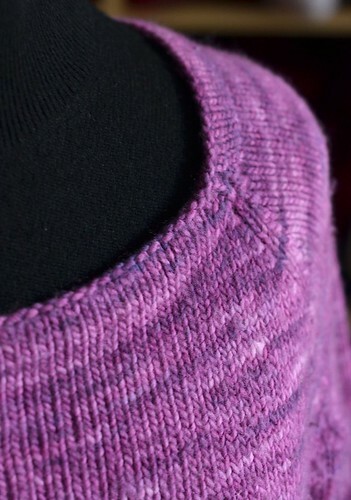 My pink Hourglass Sweater knitted in Malabrigo worsted is the best example I have of this. Malabrigo worsted is a fabulously soft single-spun merino wool. It’s super comfortable, warm, and cozy, but this is now an indoorsy-at-home sweater on account of the pilling. This yarn is soft and snuggly, but once knitted it will start to pill all over, just on account of the yarn that’s going into the fabric. Probably the least pilled part of the sweater is the front neck, because it’s the part of the sweater with no draping, was knitted last, and never gets bumped against counter-tops, purses, desks, or coat sleeves – in other words, has had the least done do it. Still, washing has to happen eventually, and even hand-washing with wool wash (as is best with most hand knits) will help it to encounter some friction. 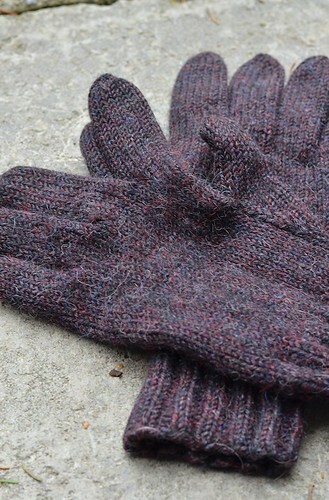 One specific place you’re likely to encounter pilling are on the mitts you wear the most during the winter – the palms of your hands take a lot of wear, holding bags, gripping bike handle-bars, opening and closing doors, getting beverages spilled on them from carrying your travel mug around, and so on. My Chilly Podsters above are a good example of this, only a year old and they’re nice and fuzzed up on the palms. The other usual suspect for pilling locations is the under-arm of sweaters, again because that’s where a lot of abrasion takes place. We are constantly moving our arms up and down throughout the day (that is, unless you should happen to not have use of your arms), so it’s no wonder that this is the first place you’ll start to see pilling on sweaters. My Gwendolyn cardigan finished late last winter hasn’t had very much wear yet but I can see the very early signs of pilling there under the sleeve. After the under-arm, for similar reasons the inside of the sleeve and near the side seam are next to follow with repeated wear. There’s no foolproof way to prevent pilling completely, but you can make choices with less pilling in mind if it is a concern for you. For starters, working with plied yarn will reduce the pilling because more plies add more stability to the yarn, and the more stable the yarn the less likely it is to succumb to abrasion. The finer and softer the fiber (ultra-fine merino, for example), the more likely it is to have problems holding up. You can also help by putting more action into the knitting – snug tension produces stiffer fabric, but also sturdier fabric. This also applies to techniques that add more tension to the garment – cables and colour-work, for example. 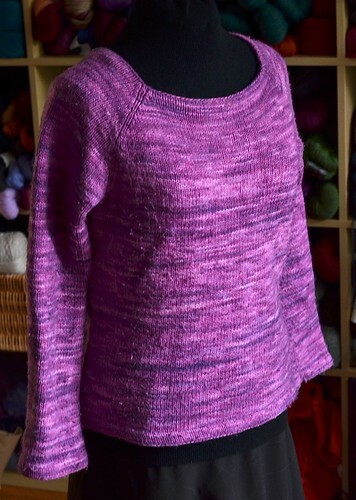 I pulled out my rendition of the Venezia pullover, (in Knit Picks Palette) which is a few years old now, and was pleased to discover that yes, in fact, it has held up pretty well. 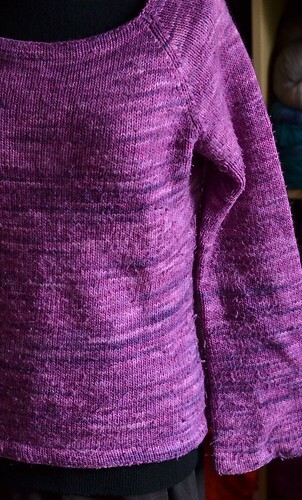 Granted, it isn’t worn as often as some of my other sweaters, which would certainly have an effect here, but stranded colour-work fabric has more going on than regular fabric – usually more snug tension, for one, thanks to the two-stranded process, but also the fact that those strands add up to a layer of floats behind the work. The floats end up taking some of the abrasion along with the outer fabric and it balances out a bit. Essentially, the only un-pilled garments out there are ones knitted in plied wool and then never worn. But the upside of this is that if your knitwear degrades a bit from pilling, then hey, I guess that means you should knit more things and get some more things to wear? And that is never a bad plan. The more pairs of socks you have in your sock drawer, the less time each one spends in rotation and therefore less wear and tear. But if you’ve got a “favourite” sweater, pair of socks, or mitts that you wear more than anything else…well, it’s only a matter of time. In that case, pilling is a sign that the knitwear is doing its job – being worn – and there’s no way any of us can look down on that. Grab your sweater stone or old dull razor and pick off the pilled bits of fuzz and keep on enjoying the coziness. Have a great Thursday evening! With some fabulous knitting in it, I hope. What is the best de-piller you know of? 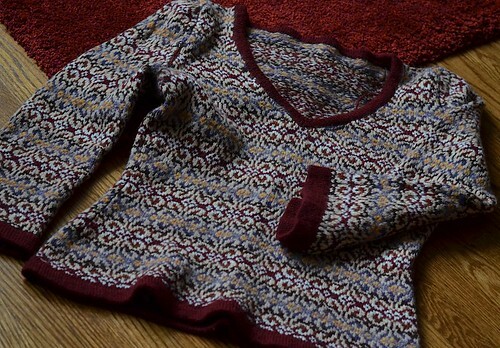 Sweater stone, those battery operated hand things…? I like to refresh my knits from time to time with some cleaning up from my Dritz lint shaver (I have the BIG one) followed by a Eucalan bath. The knits look like new. I should add that lint shavers and cotton don’t go together, but since I’ve only ever knitted one cotton sweater, I don’t worry about that. The worst pilling I’ve encountered has been with purple Cascade Eco+. The same wool in natural grey hardly pills at all. Mysterious. Jennifer – To be honest I don’t know that there is a ‘best’ option amongst them, just that it’s good to try them until you figure out the best one for you. Most of them will work moderately but there is nothing that will restore the sweater to its original state – just a de-fuzzed state. So I would recommend trying the ones that you can find available to you, and sticking with the one you like the best. Thanks for writing this! Just today, someone sent me a rav message about pilling with a yarn I’ve used a few times, and I wasn’t really sure how to respond. But now I can just send her this link! Love the post, Glenna, I learned a lot! Thank you for being willing to open your closets and drawers to honest inspection. 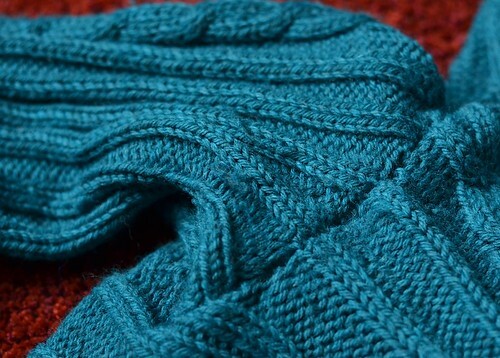 So often we see gorgeous FO shots in magazines and pattern sheets, but then read the yarn’s entry in the Ravelry database and discover that the FO will only look that good once. It’s nice to see how well-made handknits hold up to real-life wear. And it’s reassuring to hear (and see) from a seasoned knitter that, with a little forethought and attention, the pilling isn’t always as dire as it’s made out to be. This was the best explanation of pilling (and why it happens) that I’ve read yet. Thank you for sharing this! I wish that my LYS had told me how much Malabrigo pills BEFORE I made a 6-foot-long Slytherin scarf out of it. It breaks my heart to see. Thank you for this informative post! Glenna, my dear writer knitter. I am eternally grateful to all the wonderful work people do to get information and education out there. This is a marvelous example of the many works that knitters have contributed to the world that has helped so many of us progress. I am a 500% better and 400% faster learner because of your generous offerings here on your blog. Thank you, thank you, thank you!! !